Oh My! What a Long Beak You Have! What a fabulous photo! I hope he doesn't poke the other birds in the eye! The other bird does look very worried. @Corbin5 He looks a bit alert to me and also has a bird brain. I named that bird Cyrano. A wonderful name for him it is! Poor little bird, it must not be practical to bring around such a long beak. The other little animals must be scared by this long beak, I would be. I hope the other birds do not make fun of the long-billed hummingbird. @Corbin5 Better not, or he will attack them with its long beak. Great picture! I've never seen a hummingbird with a beak that long. It is a beauty. I love the coloring of the bird. @simone10 They are darling little things. They seem to be happy little birds. @Corbin5 but no kisses from the wife. @andriaperry Probably just a pat on the head with a foot. That is the longest beak I have ever seen! I know. I am amazed how that bird manages with a beak like that. @Corbin5 I guess they have to be careful not to break their beak. @snowy22315 I think you are right about that. The beak looks fragile. What an awesome photo! I hope this bird will not hurt other birds because of its long beak. I hope that bird has control over that long beak. That's incredible. I wonder why the other bird's beak is so short. Perhaps it's a youngster. It seems to have the same plumage. 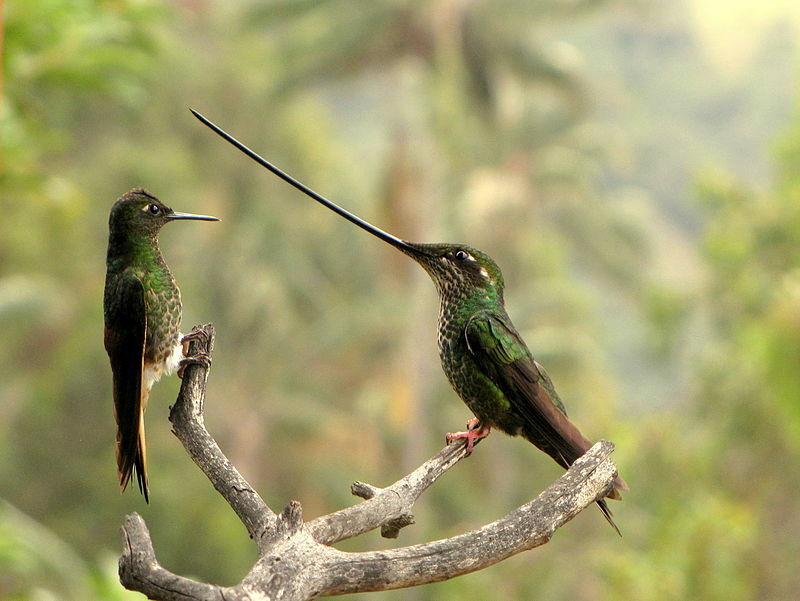 They do look similar but the other bird is a Buff-tailed coronet. @Corbin5 Oh how about that? Thanks for telling me. The colouring is quite similar really. That is a long beak Deborah. I would not want that bird anywhere near my eyes. That beak could poke an eye out, for sure. @Corbin5 It could fall over it's own beak. I wonder if they're good at fencing I'm just imagining two of these having a sword fight I've never heard of this bird, what an interesting little guy. I was imagining the same thing! Nobody is perfect. That saying applies also birds. Yes, perfection is just a wish, a hope, a dream, but not a reality. That is a long long beak for sure.If they have nests ,I wonder if the beak has to stay outside. 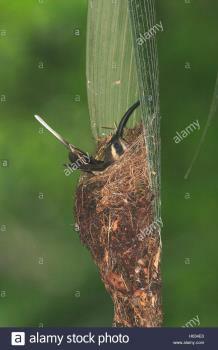 it looks like the nest is built so that the beak sticks out of the nest. Isn't that tough for them to fly through dense forest with that long beak? I never seen any birds with so long beak. They seem to fly just fine with that long beak. I wonder if its a hazard to flying with such a long beak. I would be cross-eyed if I had one of those. I would think that long beak could get stuck into something every now and then. Those are very different looking but still very pretty. I think it is a very pretty bird too. Lovely coloring. We have them visiting our garden but their beaks are not this long. Yes, this long-billed one comes from the Andean region in South America. LOL... I was just sitting here wondering what the little bird was thinking too lol!! The little guy wasn't impressed at all!! The other bird does have a puzzled look on its face. South America has some really unique kritters, the hummer in the video is beautiful. I enjoyed the video too. It would be nice to visit South American one fine day. Is this for real.I guess that it is.Thank you for sharing. Yes, it is for real. I am amazed that long beak does not get in the bird's way all the time.